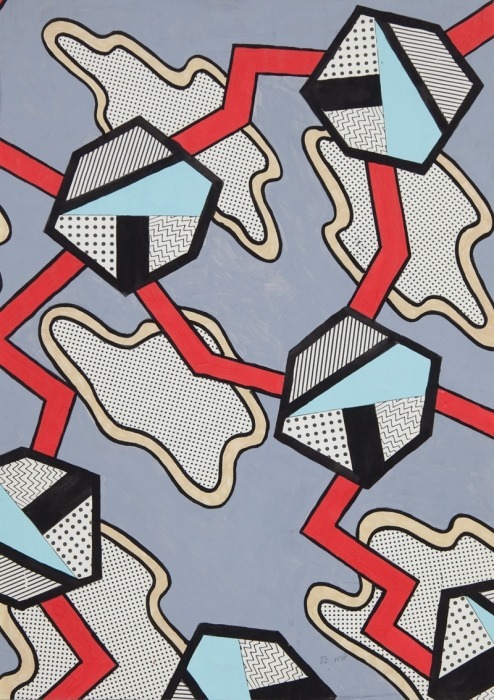 Nathalie Du Pasquier: Project for a surface, 1982. Gouache and photocopy on paper, 71,5 x 51,5 cm (framed). EXILE’S group presentation at LISTE art fair re-envisions the exhibition Homo Decorans from 1985. Homo Decorans – det dekorerende menneske was an exhibition at The Louisiana Museum of Modern Art in Humlebæk, Denmark in 1985 featuring works by architects, designers, folk and craft artists as well as fine artists. Among the participants were Mario Botta, George Sowden, Aldo Rossi, Michele de Lucchi, Keith Haring, and Nathalie Du Pasquier. The exhibition’s title and concept referenced the book Homo Ludens by Johan Huizinga from 1938. In line with Homo Ludens, the exhibition Homo Decorans focused on the post-modern use of material, aesthetic and referential sampling with a certain playful expression at its core. The grandiose, more than eight meters long painting Viva Pertini by Nathalie Du Pasquier from this particular exhibition forms the visual back-drop and historical link. Viva Pertini, which is one of du Pasquier’s earliest and certainly largest paintings, has not been seen in public since exhibited in a room alongside a mural by Keith Haring as part of Homo Decorans. Now, reconfigured through the works of a younger generation of artists, all works collectively emerge as a re-sampled collage of art works that reflects upon the painting’s expressive contend as well as the cross-disciplinary approach of Homo Decorans: at the core of all works on display stands a playful and personal creative expression without discursive limitation and boundary. Nathalie Du Pasquier, born 1957 in Bordeaux, lives and works in Milan. She was a founding member of Memphis Design in 1981. Until 1986 du Pasquier designed numerous textiles, carpets, plastic laminates as well as furniture. In 1987 painting became her main focus. Recently, a monograph entitled Don’t take these drawings seriously 1981-1987 was published by Powerhouse. Concurrently to LISTE du Pasquier holds her first solo exhibition at the gallery entitled The Big Game. Aggtelek is a collaboration of Gema Perales, born 1982, and Xandro Vallès, born 1978. The artists live and work in Barcelona. In their videos, sculptures, paintings, drawings and performances the artists investigate theoretical and practical developments of art production and its repercussions on creative practice. Issues of Globalism, Commodification of meaning, mass production paired with the current economic crisis (especially in Spain) and a current trend of hyper-individuality and artist fetish are transcribed to at times tense, at times surreal but always quite ironically dark projects. Aggtelek currently holds two solo exhibitions in Spain: at the Capella de Sant Roc, Museu de Valls in Valls and at the Museo de la Universidad de Alicante in Alicante. Erik Niedling, born 1973, would like to be buried in Pyramid Mountain, the largest tomb of all time: A pyramid at least 200 meters high carved from a natural mountain that will be reburied under the excavated material after his internment, restoring it to its original mountain shape. To make this goal a reality, he lived one year as though it were his last. He has recently shown works for the burial chamber in an institutional solo exhibition at Haus am Luetzowplatz in Berlin. The exhibition entitled Eine Pyramide fur mich brought together the current state of production for the pyramid and included the tip of the pyramid, paintings and panels, leather curtains as well as documenting material. Katharina Marszewski, born 1980 in Warsaw, lives and works in Berlin. 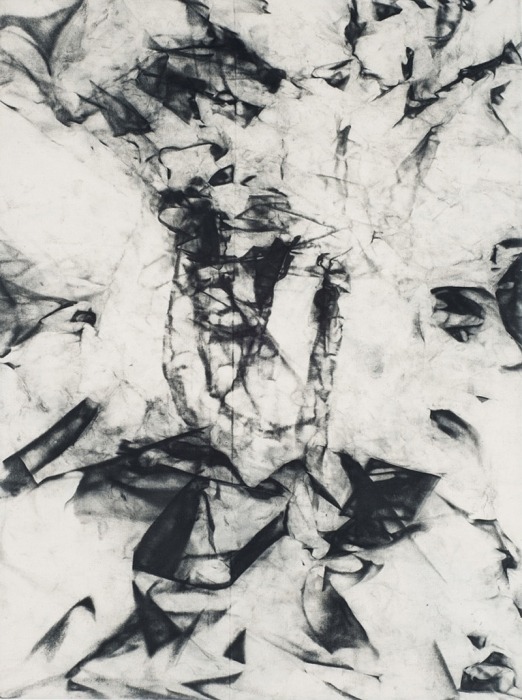 Her artistic practice begins with screen-print, collage, photography and objects and extends to temporal assemblage, immersive collaboration as well as scripted performance. She has recently participated in the exhibition Duties and Pleasures with Marc Camille Chaimowicz and Błażej Pindor at The National Museum in Warsaw and the Muzeum Wnetrz, Otwock Wielki, Poland, 2014. Martin Kohout, born 1984 in Prague, lives and works in Berlin. in 2013, his participation at LISTE included a run through the Gotthard tunnel. His work is often based in video but also includes objects, photographs as well as sound performance. He performs under the name TOLE and opened the publishing house TLTRpress. In 2014, Kohout was nominated for the Jindřich Chalupecký Award and exhibited at The Veletržní Palace of the National Gallery, Prague. Patrick Panetta, born 1977, lives and works in Berlin. His practice critically dissects and reflects upon modes of representation and contexualization of contemporary art. Recently, Panetta offered his solo booth at abc artfair for sale via an advert he placed in Frankfurter Allgemeine Zeitung. The booth was consequentially sold to another artist which turned the usual cycle of creation and commodification of an artwork on its head. Panetta recently had his first solo exhibition at the gallery entitled House of Cards in which he documented the on-going shift of perception and consumption of artworks: Videos of artworks viewed online became the artworks themselves, empty shelves point to the loss of actual engagement with an artwork’s physical presence.